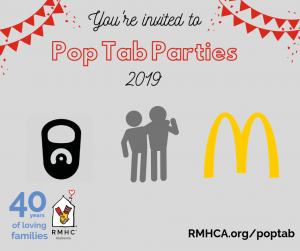 If you keep up with Ronald McDonald House Charities of Alabama, you might remember the story, “Friends Become Family” we shared this time last year. This story of several families who became much more than friends during their time at RMHCA is inspiring and shows what the House is all about. We surround our guest families with support — from the staff, volunteers and other guest families who share the same hopes and fears. During some of life’s most difficult times, beautiful things can happen. These types of relationships are just that. This year, two of the four families are here with us for their annual therapy sessions, we are once again reminded of how important the relationships built in the House often become. 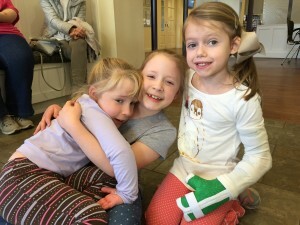 Maddie Kate and Abigail have loved having Anniston around and are busy making new memories. James and his family will join the group next week. 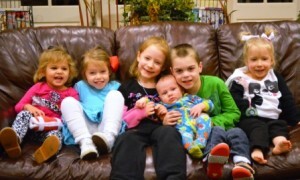 They have all grown physically over the years, but they have also grown closer together. Adopt-a-family to ensure that they are able to build these instrumental relationships.